After 100 years, one can expect a few changes. The Southern Methodist University Cox School of Business, nearing it’s centennial celebration, is a perfect test-case for how much change can mean. Founded in 1920 as the Department of Commerce, the Dallas metro business school has gently evolved from a modern Methodist research beacon into one of the most transformative schools in Texas. 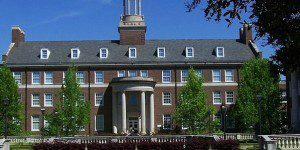 With over 11,000 students at SMU, including 5,170 graduate students, the Cox School of Business hosts nearly 600 MBAs in its various programs. For any Cox student, one of the definitive advantages of the business school is the advantageous proximity to Dallas’ thriving business community. Ten companies in the metro land within the Fortune 500 ranking. Among the group, four companies—Exxon Mobil, AT&T, Energy Transfer Equity, and American Airlines Group—land in the top 100, with two in the top ten. With high national regard, including a top 50 ranking for the school in U.S. News & World Report, plus the bevy of major companies as neighbors, these factors can seem overwhelmingly beneficial to a successful career. When talking with members of the SMU Cox School of Business Professional MBA class, however, the allure of the program went beyond the obvious career benefits that Dallas can offer. For any well-regarded business school, the makeup of the class can seem familiar. The average GMAT for the PMBA Class of 2019 is 613. The GPA is 3.3. Most of the group has about five years of prior professional experience before enrollment. But just going off the bare statistics hardly tells the entire story. To get a greater understanding of the SMU Cox School of Business Professional MBA class, we spoke with several current students, including a self-described “Army Brat,” a former law school student, and a consultant originally from Kathmandu, along with a handful of other future grads. Read on to see their stories and what the future may hold for life after an MBA. Matthew Korman is the Managing Editor of MetroMBA. Graduating from Rowan University with a degree in journalism and political science,, Matthew has worked in the field since his days in college as a freelance music industry writer and promoter. His works have appeared in publications such as NPR and Sports Illustrated.